Whatcha up to? Stopping by for the latest fix of TheFrugalSamurai? But bear with me a little please, it’s the morning after of the buck’s party for my friend Bubu. Mind you, after the passing of my Grandma recently, I wasn’t quite in the mood for excessive celebrations and called an early night. But that’s not to say that we didn’t have a great get-together. Between all the drinking and cheering and light misdemeanours – I managed to have a few words with a couple of the guys about investing and the markets in general. “Yeah, I prefer Vodka myself – more crisp”. “So guys, I bought some APPLE the other day”. 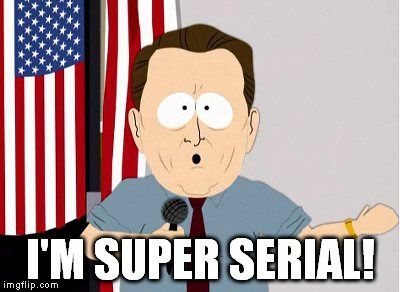 “Oh nice one – you know it’s the first trillion dollar company right”? A company worth 1,000 x 1,000 x $1,000,000. And you know, there’s a few companies (e.g. Google, Microsoft) within touching distance of that trillion dollar mark as well – Amazon itself sneaked a toe over the line last week. A trillion dollar company would make it more wealthy, powerful and influential than some entire global regions. So what’s that mean? A sign of renewed strength from a US economy on the up and up? 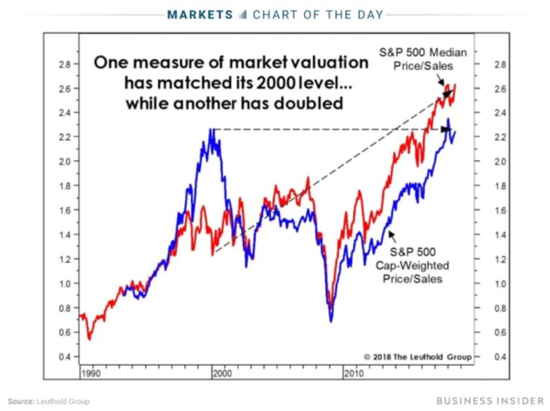 Or another piece of evidence supporting the theory that markets are grossly overvalued? The US share-market indices are on a record bull-run, having hit record highs again and again. This year – it’s having a good year. Hey! 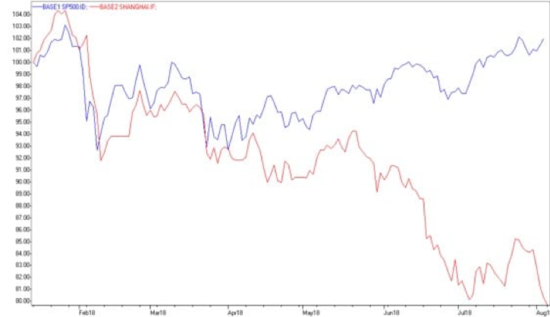 April is when MrsFS and I got married… you could say that the blue line is her and the red line is me… ha ha only joking dear. America’s pumpin’, your heart starts thumpin’, now you know what to do just bust-a-move. Sorry, sorry – got carried away there. Young MC Bust A Move quotes aside, the contrarian argument is that American markets hitting record highs means a reversion to the mean i.e. a drop is more than likely. In support of this, have a look at the ratio of price to sales – the value of a company relative to its revenue. Generally, the lower the ratio, the more attractive the investment (Investopedia definition here). The red line is the median price to sales, whilst the blue is the market-cap weighted price to sales. And look at that trajectory! One has doubled since the GFC. The other is back to a peak not seen since the .com bubble. So… is that ominous? Or just what the markets should be doing? Now, now – before you start jumping up and down – remember, this is not a political blog. I’m not saying he’s an economic mastermind or anything like that. I’m saying that the economic policies which he has brought in such as the tax cuts and tariffs on foreign production, those policies are having a real impact. Who knows if that’s what the impact he was going for – but it’s happening. Hmm, I may be wrong but there’s a story developing here. 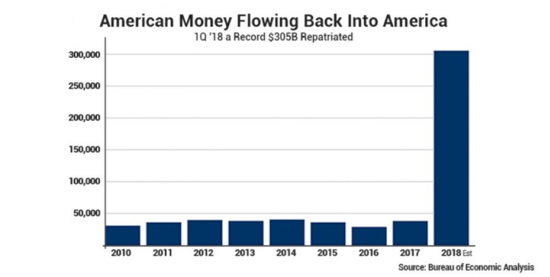 A 6 year old will tell you that there’s something going on with that graph – the amount of money being repatriated (brought back home) to America by US companies. As we all know, money coming in is much better than money going out. In just the 1st quarter of 2018, American firms re-directed $305 billion back home. Which is more money flowing back to the States than in the previous 7 years COMBINED. And what is going to happen to all that money? Some will go into share buy-backs, but much will be invested and turned into economic activity. This is huge. Seriously good news for the US economy and the American stock market. Well, nothing is ever permanent in investing, but for the moment – the up-trend looks here to stay. Which is why I’m not betting against more companies joining the trillion dollar club – might have a punt on Apple myself! Amazing read… does this mean Donald is actually doing an amazing job despite the blind hate? Yeah, it’s almost like throwing darts at a board – going for the triple 20 and hitting a “1” or vice versa. Oh nice one! How was your bucks? Oh don’t be (for 3) too disappointed, have some Jasmine tea instead – great hangover cure.